Five people were killed on the spot, while four others were seriously injured and rushed to a nearby hospital for medical attention. It was a tragic Tuesday for residents of Ija-Ugbo, Arogbo Ijaw town, in Ese Odo Local Government Area of Ondo State. 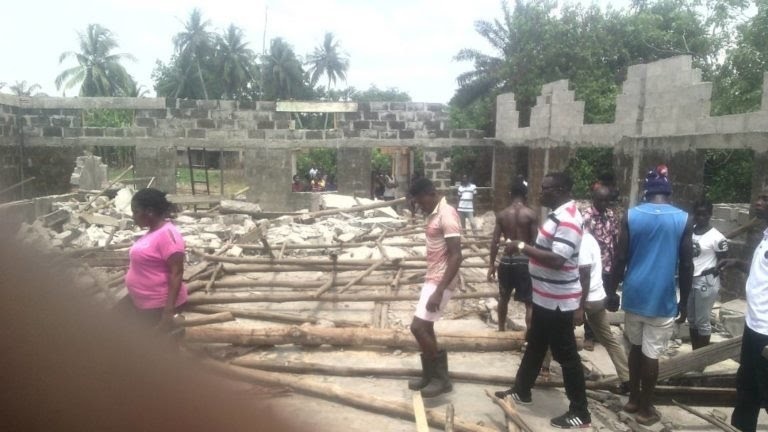 A Cherubim and Seraphim Church collapsed killing no fewer than five persons, all women, including a pregnant woman. The building was said to be under renovation when it collapsed. According to an eyewitness who did not want to be named, the five causalities were not worshippers but had gone to the construction site to fetch disused planks when the incident happened. As expected, the tragedy has thrown the community into mourning. “This is the first time that such a thing will happen in this community. It was caused by the inferior materials used for the renovation of the church,” said the eyewitness. Ondo State Police Public Relations Officer, Mr. Femi Joseph, confirmed the incident, describing it as sad and unfortunate. The PPRO identified the victims and explained that the victims were killed while struggling for wood at the site. Narrating what really happened, he said, “A renovation was going on in one of the churches in the area. The owners were trying to build a bigger church. While trying to demolish the old one, the building collapsed just as people were struggling for disused wood. He said the command had begun investigation into the incident, while the corpses of the victims had been deposited in a morgue.